In addition to the very real savings that BIM brings in time and cost, an increase in collaboration between all stakeholders involved in the BIM process ensures improved planning and design, a better understanding and transparency between all parties, and a notable reduction in project risk. Upon completion clients benefit from the possession of the whole building model, which can be effectively utilised for the future management and maintenance of their asset. Working at the cutting-edge of this technology, Knapp Hicks have successfully implemented BIM into the practice, and actively promotes the sharing of information and a collaborative approach. 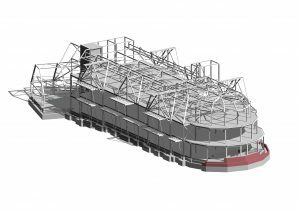 If you have any queries regarding BIM and the services we can provide, please contact us and we would be delighted to discuss in more detail.